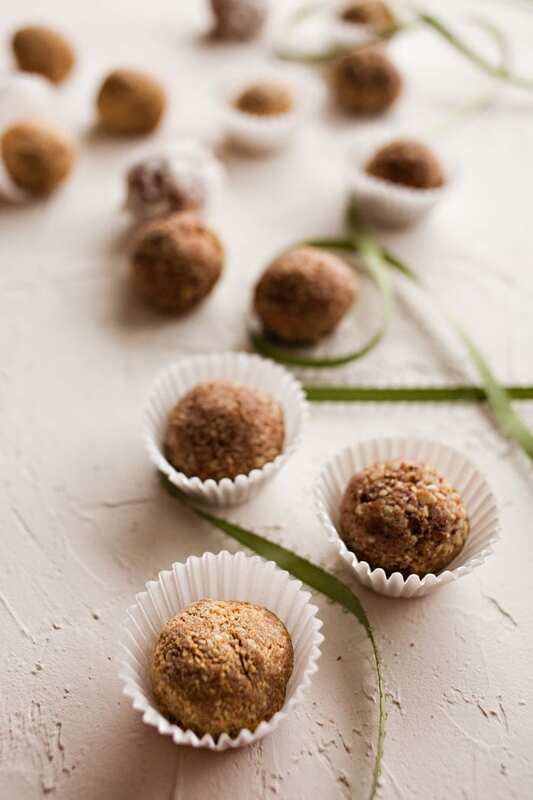 Soft chocolate balls are rolled in nuts or cookie crumbs for a super easy holiday treat! Easy to make and so delicious, Almond Chocolate Meltaways will be the first to go at any party! If you are looking for a new cookie recipe to try for this holiday season this is it. 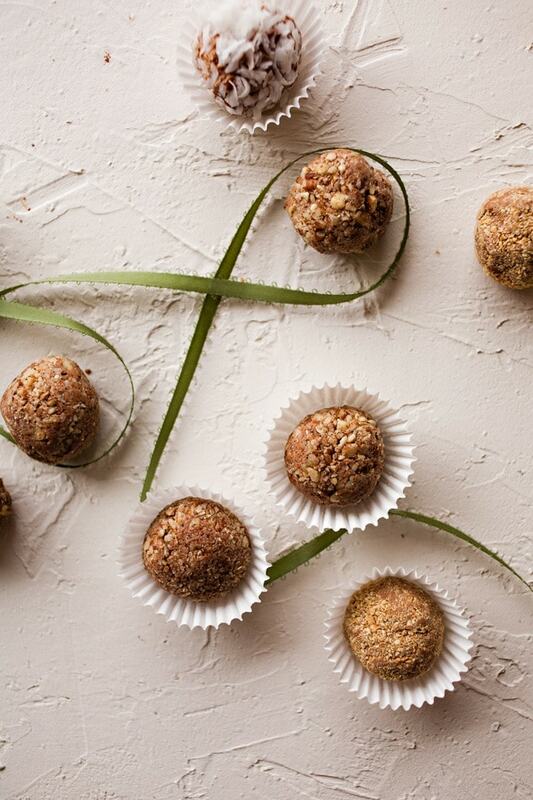 They also make great treats for cookie exchanges, sharing with neighbors and gifting. 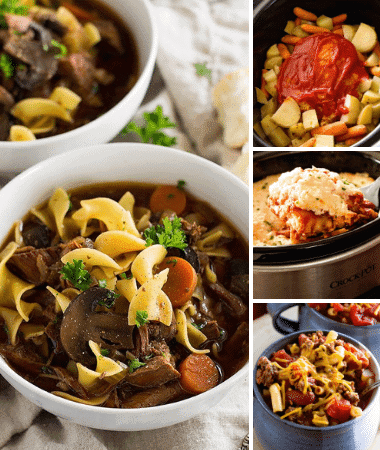 You can make so many different flavor combos that there will be one for everyone! It’s holiday baking time! This is one of my favorite times of the year. I’m always on the lookout for new treats to try. First I made this amazing Graham Cracker Toffee Crack. Next I made these Chocolate Almond Meltaways. My family LOVES my Peanut Butter Ritz Cookies and Salted Almond Caramel Thumbprints so those will need to be made too! These tasty, cute treats only have three ingredients, and require no baking! I call that a win! First, you’re going to need a pound and a half of chocolate. That amounts to about six large Hershey’s Candy Bars (the 4.25 oz. size). (The total weight comes out to 26 ounces for all six bars together. You need 24 ounces, so you can just break off a little of one of the bars and leave some out). It’s not imperative that you get the amount just right here. A few ounces in either direction isn’t going to make a big difference. Break all the bars into pieces and put them in a large pot. 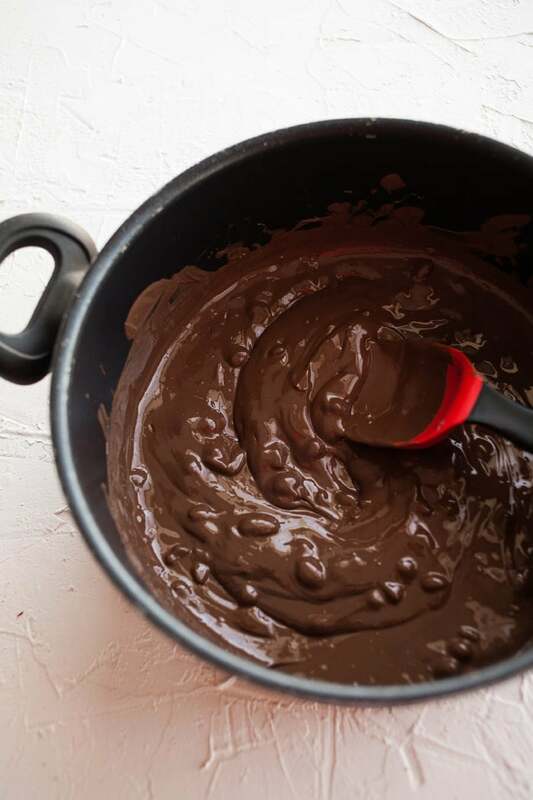 Put the pot on the stove over low heat and stir frequently until all the chocolate is melted. Set that aside to cool just a bit while you put one-and-a-half tubs of Cool Whip (the eight-ounce size container) into a large bowl. You need 12 ounces of Cool Whip altogether. Now pour the melted chocolate over the Cool Whip (don’t worry if it’s still hot) and stir everything together until it is well-blended. Then cover with plastic wrap and put in the refrigerator for at least two hours (or overnight) to chill. After the mixture has chilled, it’s time to roll it into balls. For this, you will need a small cookie scoop. The mixture will be soft and sticky. The consistency is kind of like marshmallow fluff. What you’re going to do is scoop up the chocolate mixture and then drop it into your coating of choice. I used crushed graham crackers, chopped pecans, and coconut. Don’t try to handle the chocolate mixture before you drop it into your coating. Remember that it’s super sticky! 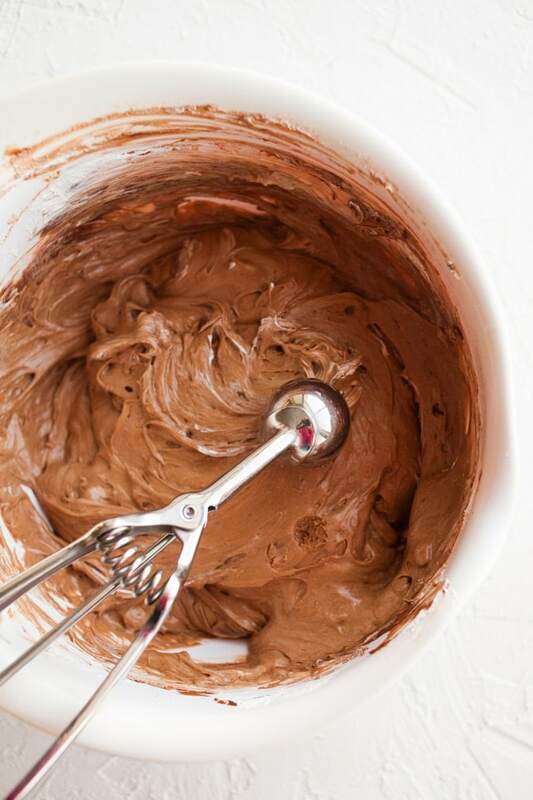 If needed, use a spoon to coax the chocolate mixture out of the cookie scoop. Once you drop it into your coating, shake the bowl with the coating around a little, and drop some coating on top of the chocolate mixture so that it gets covered. Then pick up the ball and gently and quickly roll it between your hands to make it smooth. Viola! You are done! 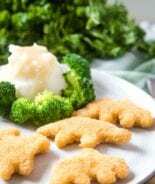 Place the rolled balls onto a lined cookie sheet (I lined mine with waxed paper, but you can use parchment paper or foil) and chill until ready to serve. The great thing about these is that you can freeze them, and they still stay soft! They are the perfect treat for holiday parties. 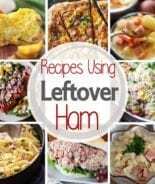 You can make them weeks in advance and just keep them in the freezer. They are nice to have on hand when guests drop by. You’ll always be ready with a tasty treat! 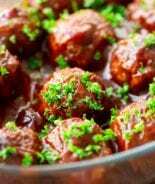 This recipe makes 60+ balls. You can easily cut this recipe in half by just using three Hershey’s Milk Chocolate with Almonds candy bars, and 3/4 of a tub of Cool Whip. 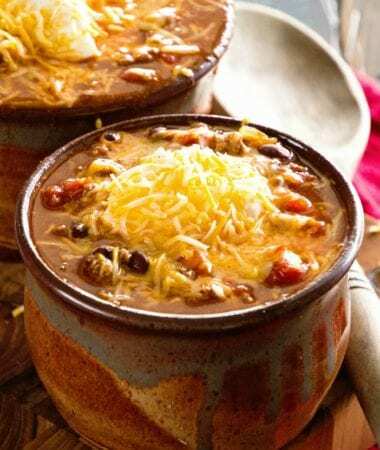 Love this easy recipe? Me too! 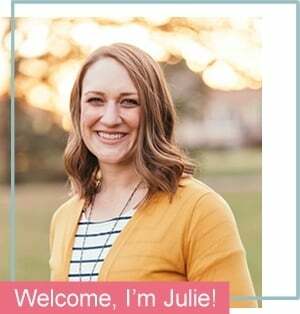 Be sure and snap a photo for Instagram and tag me using #julieseatsandtreats or @julieseatsandtreats! 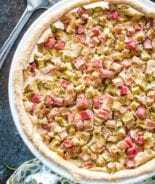 Be sure and comment below and leave a 5-star rating, you will love this holiday treat! 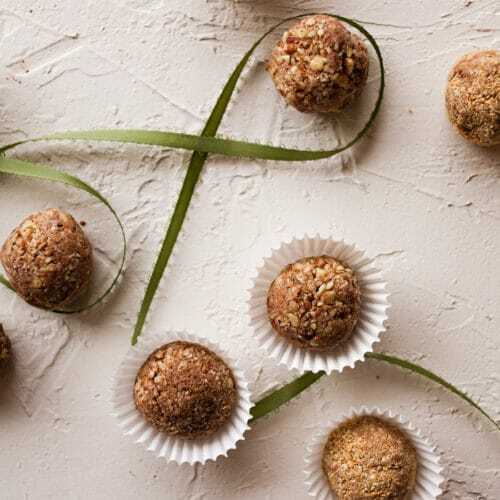 Soft chocolate balls are rolled in nuts or cookie crumbs for a super easy holiday treat! 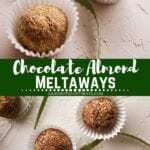 Easy to make and so delicious, Almond Chocolate Meltaways recipe will be the first to go at any party! 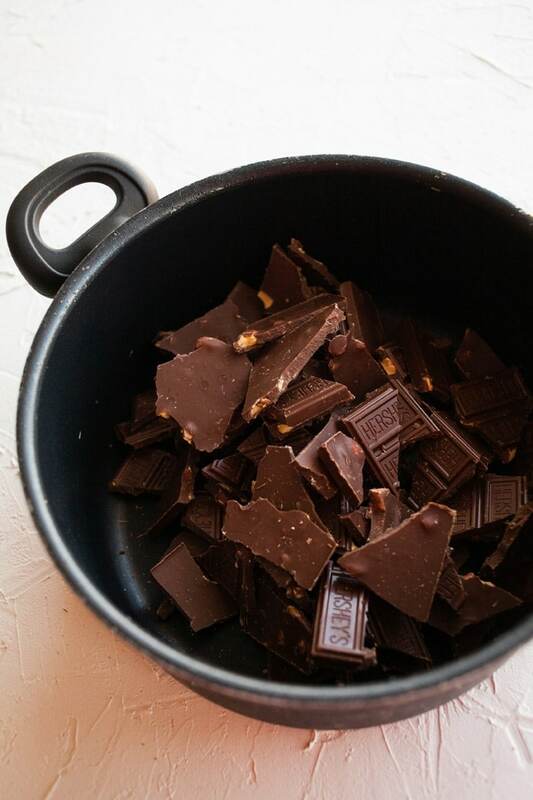 Break up the chocolate bars into a large pot. Heat over low heat on the stove until chocolate is completely melted. Stir occasionally while melting. Remove from heat when chocolate has completely melted. 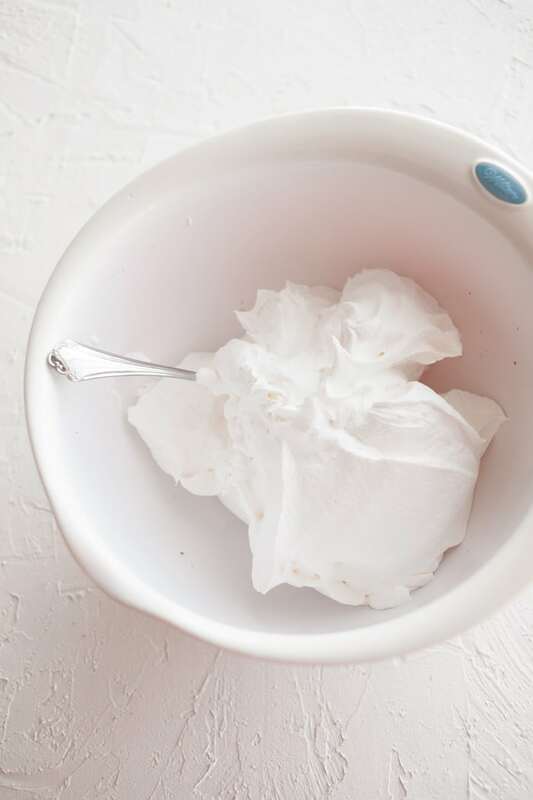 Place the 12 ounces of Cool Whip into a large mixing bowl. Pour the melted chocolate over the Cool Whip and fold together until everything is well blended. Cover and chill for at least two hours, or overnight. 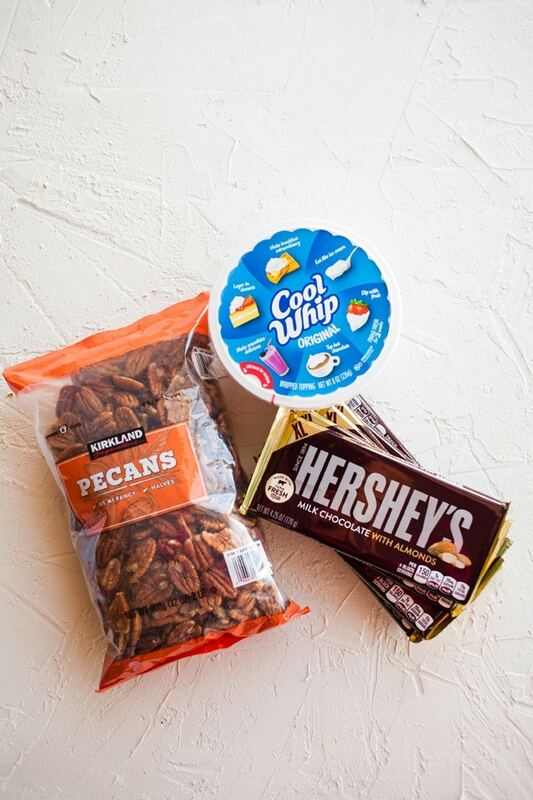 Place chopped pecans or crushed cookies into a small bowl. 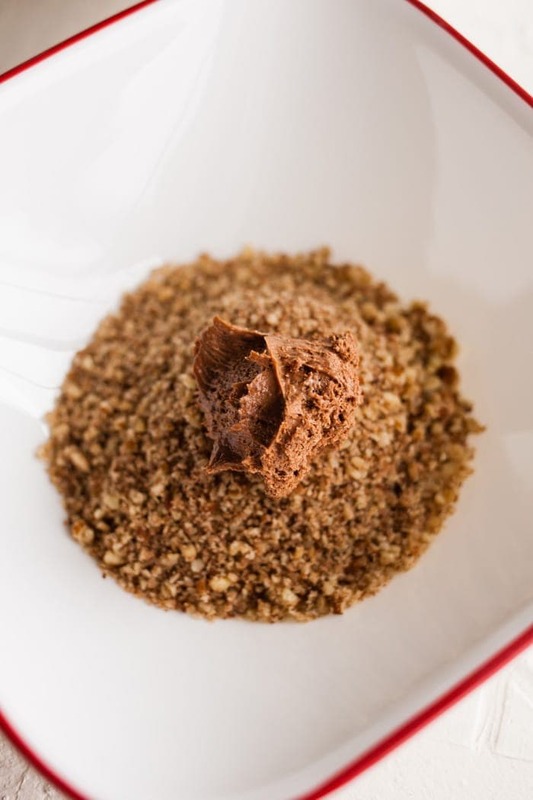 Using a small cookie scoop, drop balls of the chilled chocolate mixture into the chopped nuts or crushed cookies. Gently shake the bowl to cover the chocolate balls with nuts or cookie crumbs. Pick up the balls and quickly, but gently roll them between your palms to smooth them out. 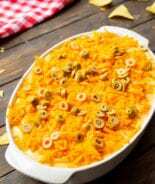 Place on a lined cookie sheet and chill or freeze until ready to serve. Oh my goodness! 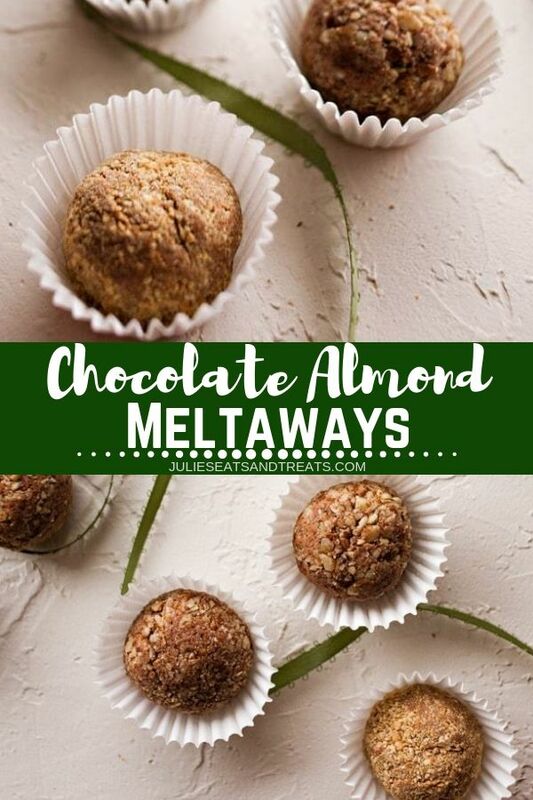 These Almond Meltaways look amazing! I don’t think I’ve had anything like them but I’d love to try! Oh this is perfect for the holidays! Looks so good! Perfect for those cookie trays!